Whew! The first block of photoshoots is done and now we all get a weekend off to enjoy the Halloween festivities. I've added more photos from last weekend to the gallery. We shot the fox hunt, the stable scenes, and a random traveling scene. For this third set of photoshoots we were on location, shooting the High Desert Chapel scenes and a few early morning photos outside Camelot. Click the picture below to go to the dailies gallery (all work safe) where I've added some new pictures from this past weekend. SG/GK: first weekend of shooting! Woo hoo! One weekend down, eight more to go. Thank you to all who helped make the first weekend of shooting for Sir Gawain & the Green Knight such a success! The book is going to look great! I've posted some behind-the-scenes photos (taken by various folks with the back-up camera that was passed around) as well as some images that approximate what will end up in the book. I was tempted to call those "production stills", but since they're all stills it seemed redundant. I've done some quick & dirty photoshopping on them but I've definitely got a lot of work to look forward to in post-processing in order to polish them up. Still, I think there's a lot of potential there and I'm quite encouraged with the progress so far. It's a little hard to believe it's actually happening! First a reminder: construction party starts at 10am this Saturday. There'll be some woodworking, lots of paper mache, and also some tracing & paint-by-numbers type work. eekabelle, mister_b33, and I had a good time today building the round table for the Camelot feasting scenes. Attention locals! We'll be having construction parties in Sunnyvale on Saturday September 13th and 27th to build some walls for the photobook project. We'll be at the ABL and start at 10am and go into the early afternoon. If you have an extra hammer or cordless drill, go ahead and bring it. This Saturday we'll be making benches to use in the chapel and feasting scenes; so tasks will include sawing, hammering, and painting. The other Saturday will probably be making the stained glass windows for Camelot; we'll make wooden frames and then paint plastic panels with black "leading" and fill in with translucent colors to get the stained glass effect. eekabelle has posted a list of some of the things we're looking for (props, decorations, furniture, etc). Check it out the lists here and here and let her know if you have any stuff we can borrow/have for the photoshoot. The casting process continues, with some roles filled and some still open. I continue to find new and creative ways to procrastinate sending the emails to figure out schedules for everyone; slowly but surely I'm making progress there as well. 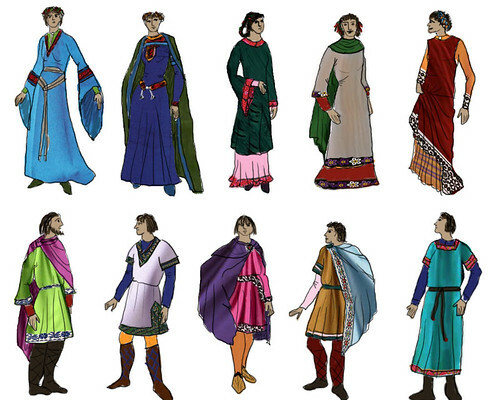 For the visual component of this week's update, here are some colorful Camelot garments (untrimmed, but otherwise done) and a few location scouting shots. I'd hoped to be posting that casting for the major characters was complete, but I've decided to wait a little bit longer. In the meantime, I've made some costume pieces for the deer people. I started with these since it doesn't matter that I don't have measurements; the clothes are supposed to be primitive and a little shapeless. Next step is to acquire/make antlers for them. I'm starting to feel the pinch of my self-imposed deadlines; it's a good thing I'm going into this phase well-rested! July was mostly devoted to acquiring props. The shopping was fun, but getting to bury myself in arts & crafts for days on end was really great. Now that it's August, I'll be switching focus to costume work. To keep on schedule, I'll need to have the cast finalized by mid-August so I can get started getting measurements and farming out at least some of the sewing. Casting is proving tricky but it's not terribly unexpected and I remain optimistic that it will all work out eventually. So, if you've been thinking about volunteering and I haven't heard from you yet, now is a good time to speak up! I've revised all four storyboard sections now and made minor updates to the costume and set designs. To see the updated stuff, click through to the Project Bravo Gallery. If you're just interested in gratuitous Barbie slash, click here for the newly added closing montage. June should be an exciting month. I'm going to try to wrap up the research and design phase and transition to actually buying and building things. The casting call should also go out in the next few weeks, so if you are local to Northern California (or are willing to commute ;) ) start clearing your calendar so you'll have some free weekends this fall/winter. In the meantime, here are some more designs: a fireplace and room dimensions for the feast halls. Yippee! I finished assembling the chariot prototype! These only exist digitally so far, but I'm hoping to build the first chariot this week (mostly as a prototype for the others, but I'm sure we'll use this one in the back somewhere too). I've already taken salvaged wheels from my old wrecked bike and ordered some axle parts from McMaster-Carr ... next step is raiding our scrap wood pile to build the box. In other news, people near San Jose should check out Triangle Machinery before they close their doors in August - there are just piles and piles of fabulous industrial surplus in need of a good home: gears, motors, tubing, drill bits, oscilloscopes, and more! I myself am now the proud owner of a control pad for a robotic arm (only $5!). I don't have the robotic arm, though; I'll have to see what I can do to remedy that. Yay! I finished a bunch of costume sketches. I don't imagine the final costumes will actually look much like this, but the exercise was really useful in pushing the costume design forward. Having to actually come up with a specific color/pattern for every sleeve and shoe, etc helped me shape up some of the parts of the design that were too vague before.